Water molecules frozen on the Moon hop around the lunar surface each day, according to new research based on data from the Lunar Reconnaissance Orbiter (LRO). Small quantities of water, found on tiny grains of the lunar surface, are heated by sunlight near noon each lunar day. This process drives molecules of water to migrate into the shade of neighboring grains, where they freeze once again. This finding is the latest in a series of recent discoveries showing how water is more common on the lunar surface than previously believed, aiding future explorations of the Solar System. “These results aid in understanding the lunar water cycle and will ultimately help us learn about accessibility of water that can be used by humans in future missions to the Moon. A source of water on the Moon could help make future crewed missions more sustainable and affordable. Lunar water can potentially be used by humans to make fuel or to use for radiation shielding or thermal management; if these materials do not need to be launched from Earth, that makes these future missions more affordable,” said Amanda Hendrix, senior scientist from the Planetary Science Institute in Tucson, Arizona. The Lyman Alpha Mapping Project (LAMP) instrument aboard LRO produced a far-ultraviolet spectrograph to measure the presence of water as it migrated from one place to another on the Moon. The water molecules become heated as noon approaches an area of the lunar surface, driving them to another nearby region offering more shade. The highlands of the Moon hold onto larger quantities of water than the lower mare regions, likely due to the greater number of suitable grains in the highland surface, offering refuge for the molecules. Recent research has shown the solar wind, emanating from the Sun, is capable of forming water on the surface of the Moon, as it interacts with materials on the lunar surface. This process is temporarily halted during the portion of the Moon’s orbit when it is shielded from the solar wind by the magnetotail of the Earth (the region of space influenced by the magnetic field of our planet). Observations from the LRO show the migration of water on the moon does not change during these periods, suggesting the water seen moving through this process is built up over time on the lunar surface. “This is an important new result about lunar water, a hot topic as our nation’s space program returns to a focus on lunar exploration. We recently converted the LAMP’s light collection mode to measure reflected signals on the lunar dayside with more precision, allowing us to track more accurately where the water is and how much is present,” said Kurt Retherford, of the Southwest Research Institutie (SwRI), principal investigator of the LRO LAMP instrument. 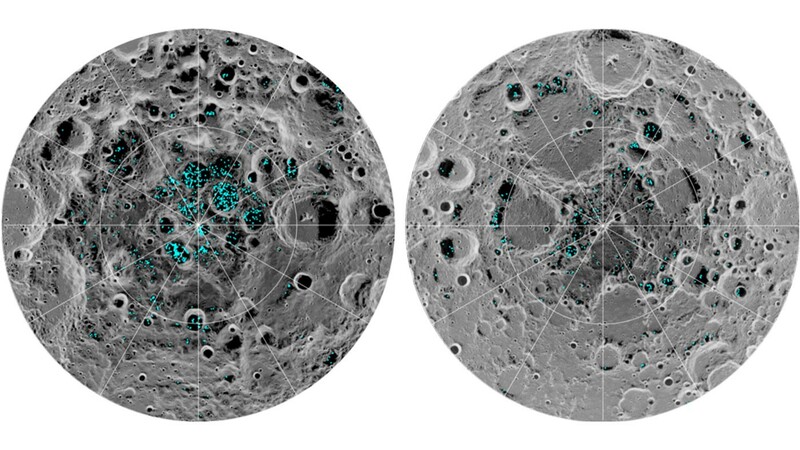 Deposits of water ice on the Moon (highlighted in blue), mapped by India’s Chandrayaan-1 spacecraft. 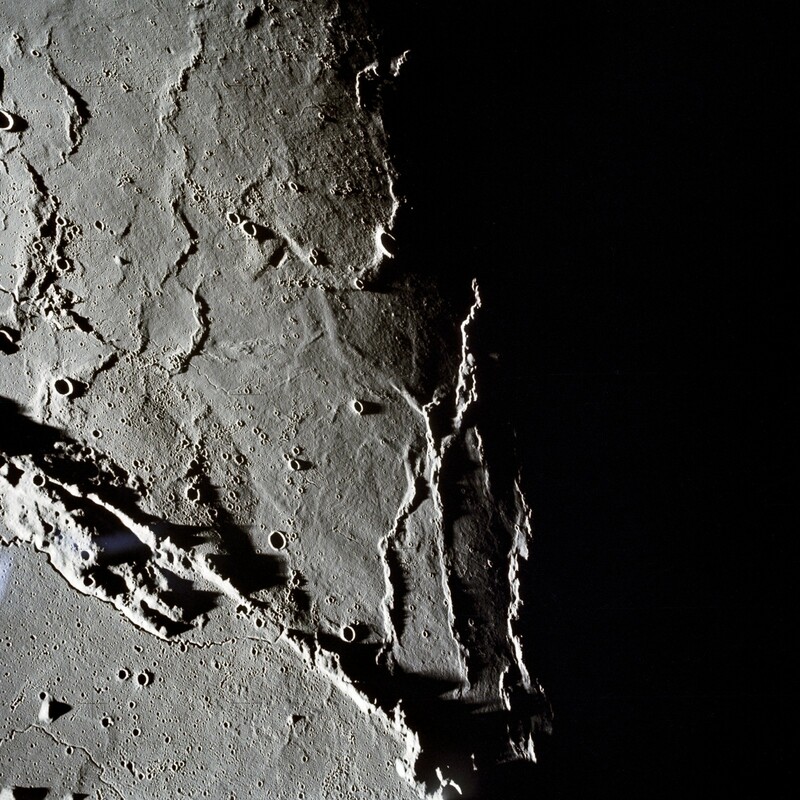 The ice seen here is concentrated at the south (left) and north (right) poles of the lunar surface. Not long ago, the Moon was considered to be a barren place, utterly devoid of water. It was only in August 2018 that water ice was confirmed for the first time, sitting at the polar regions of our planetary companion.